I have practiced law for over 40 years. I received my undergraduate degree from Franklin & Marshall College in 1969 and my law degree from the University of Connecticut in 1977. I am licensed to practice law in Connecticut, New Mexico, and Arizona. 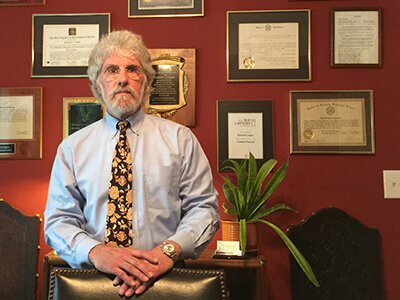 I was a public defender in Connecticut, a prosecutor in New Mexico and am now a sole practitioner whose practice is limited to criminal defense. I have significant experience in criminal defense in a variety of jurisdictions throughout the United States. I've tried at least 200 felony jury trials to conclusion in state and federal courts and have a record of acquittals equaled by few criminal defense attorneys. I've served as lead counsel in 15 death penalty cases. Two of these cases resulted in verdicts of "not guilty" on all counts, including a case involving the murder of 3 individuals at a Tucson market in 1992. My role in the case was featured in an article in the January 17, 2005 edition of The New Yorker, authored by Jeffrey Toobin. While a private practitioner in New Mexico in 1982, I first appreciated the unique nature of prosecutions involving allegations of sexual abuse of children. I was instrumental in developing a national network of lawyers and experts to confront the difficulties in defending such cases. In the past 30 years, I've defended scores of individuals accused with acts of sexual misconduct in both criminal and civil proceedings. These cases have included claims based on shaken baby syndrome, repressed memories, and the child sexual abuse accommodation syndrome. I am now a nationally recognized expert in the defense of such cases and am regularly called upon as a consultant, expert witness, and speaker at legal educational functions throughout the country. I've been named in Tucson Lifestyle Magazine as one of Tucson's Top Lawyers for 2011. I was acknowledged by the State Bar of Arizona for receiving the second-highest overall score on the February 1989 bar examination. Martindale-Hubbell has designated me with its highest rating, AV, and has me currently listed in its Bar Registry of Preeminent Lawyers. I've been listed in the 2007 - 2013 issues of Southwest Super Lawyers magazine. I've been accepted as a Life Member of the National Registry of Who's Who published in the 1999 edition. In 2002, I was a recipient of the Champions of Justice Award given by the Pima County Consolidated Justice Courts. I received the John J. Flynn Lifetime Achievement Award from the Arizona Attorneys for Criminal Justice in 2003. I've tried at least 200 felony jury trials to conclusion in state and federal courts and have a record of acquittals equaled by few criminal defense attorneys.